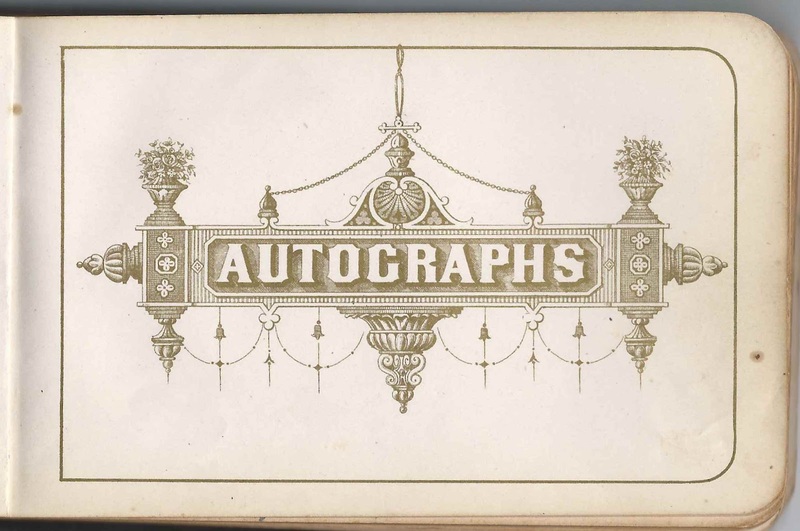 1880s autograph album of Anna Fessenden Norris of Waltham, Massachusetts. 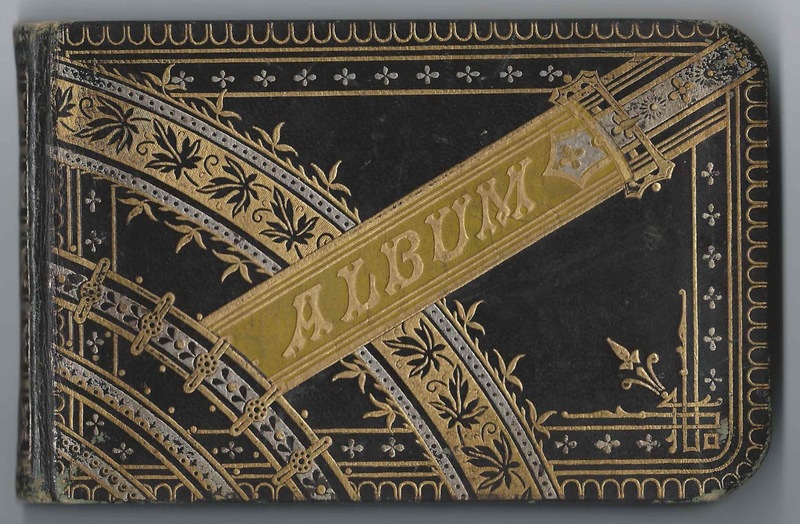 The album is approximately 6-1/4" x 4" and contains the sentiments of 65 of Anna's relatives and friends from Massachusetts and Maine. An alphabetical list of the signers appears at the end of this post. Anna Fessenden Norris was born 3 October 1871 at Waltham, Massachusetts, the daughter of John Elbert Norris and Mary Ann (Viles) Norris, who were born at Dorchester, Massachusetts, and Weston, Massachusetts, respectively. Neither of Anna's parents signed in the album; they may have signed in another. 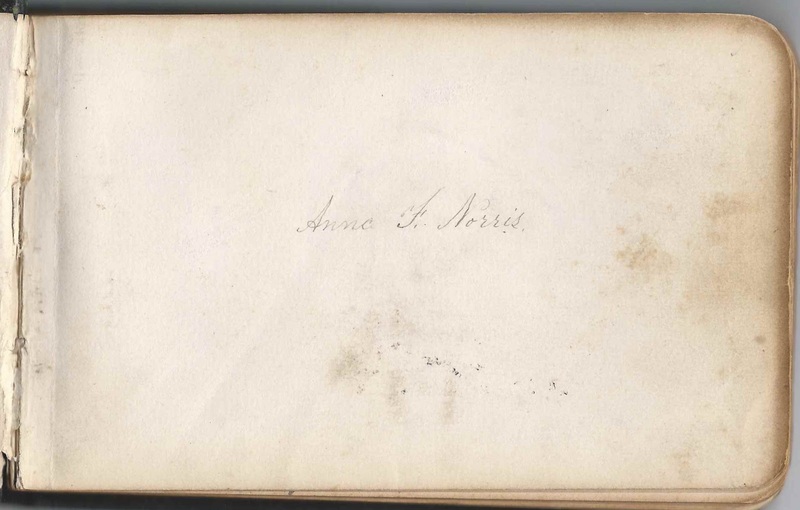 However, two of Anna's mother's sisters signed pages in the album. 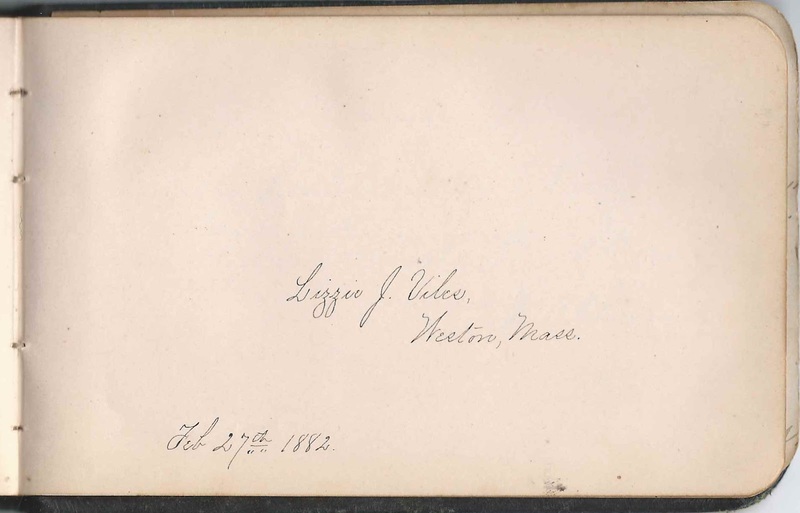 "Aunt Ella", who presumably was Ella Maria Viles, younger sister of Anna's mother Mary Ann (Viles) Norris, signed a page on February 27, 1882. She would later, in 1887, marry Walter Fay Baker. Another sister of Mary Ann (Viles) Norris and Ella Maria Viles signed a page. She was Lizzie J. Viles, or, formally, Elizabeth Jones Viles, of Weston, Massachusetts, who also signed a page on February 27, 1882. On 31 January 1889 at Waltham, Massachusetts, Anna Fessenden Norris married Edward Davis Bliss, son of David and Annie Hannah (Bryant) Bliss. Edward was born 21 January 1868 at Waltham, Massachusetts. 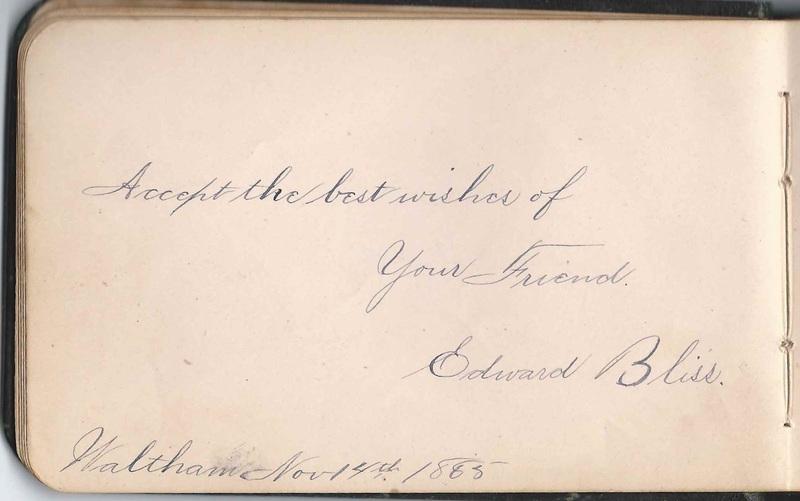 He signed a page as Edward Bliss at Waltham, Massachusetts, on November 14, 1885. According to the Censuses, the couple lived at Haverhill, Massachusetts, and Townsend, Massachusetts, and raised three children. Davis H. Austin of Waltham, Massachusetts, signed on September 22, 1883. He was born in 1869 at Peru, Maine, the son of William and Judith (York) Austin. B. W. Drake; presumably Bradford Winslow Drake, Sr., of Waltham, Massachusetts. He may have been the principal at Anna's school. Ethel E. Felker, signed at Boston, Massachusetts, on September 8, 1884; in one corner: "B.H., B.C." in the other corner: "E.W." Katie Inez Hodgdon of Waltham, Massachusetts, signed on February 20, 1882; "Ever your little friend"
Kit Lewis of Waltham, Massachusetts, signed on July 10, 1886; mentions "Lily Point Grove", which is located along the Charles River between Waltham and Weston. E. J. Pickering or C. J. Pickering; appears to be the writing of an elderly person. 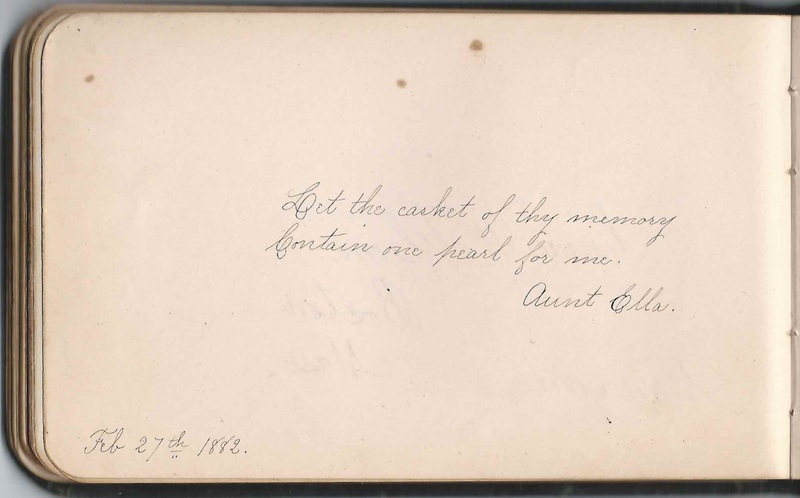 Fannie Potter of Waltham, Massachusetts, signed on "1884.4.2." Ella L. Starbuck; "your little play-mate"
M. Tobey; middle initial might be E. or C. or ? Aunt Ella, signed on February 27, 1882. Anna's mother, Mary Ann (Viles) Norris, had a younger sister named Ella Maria Viles, born 18 February 1864. Ella Maria Viles would marry Walter Fay Baker in 1887. Lizzie J. Viles of Weston, Massachusetts, signed on February 27, 1882. Presumably Lizzie Jones Viles, a younger sister to Anna's mother Mary Ann (Viles) Norris.